You’ve been doing so well throughout the years. Even though you’re missing a couple teeth, it hasn’t prevented you from doing your regular daily tasks. 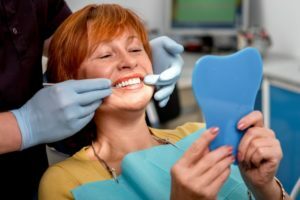 However, leaving large gaps in your smile has the potential to reduce your mouth’s regular functions, even if you have dentures or removable bridges. Luckily, there’s dental implants are available as a tooth replacement option. These can save your mouth, jaw, and bone from deteriorating too quickly. Additionally, you’ll be able to enjoy the foods you love and look your best. Keep reading to learn the benefits dental implants has to offer. When you lose teeth, it affects the relationship between your bone underneath it. When your teeth are missing, they fail to stimulate the bone and gum previously connected to it, causing your bone to shrink and gums to begin receding. This only makes your jawbone weak over time and your gums more exposed to bacteria. As your bone deteriorates, neighboring teeth will also begin to weaken and eventually collapse. Teeth in the opposite jaw will also start growing into the gap to fill that empty space. That’s where dental implants come in. If you have missing teeth, you may have noticed your face looks older and more wrinkly. Your cheeks may start to sag sooner than normal and you may appear to have a sad demeanor. This is because your reduced jaw bone no longer stabilizes your lips and cheeks from the inside. Dental implants reverse this because they are designed to stimulate your bone. Unlike other tooth replacement options, dental implants act as a prosthetic root. The function of this prosthetic is truly multi-pronged because not only does it give your ceramic tooth a place to live, but it promotes bone growth, which in turn keeps the gums taut. This also prevents any further atrophy from occurring, making doing regular tasks like talking and eating much easier and more enjoyable. A common side effect of dentures is not being able to taste or eat food the same way as in the past. This is because the upper palate of your mouth is covered. This area contains a few taste buds which play a role in tasting the foods you eat. Unlike dentures or removable bridges, dental implants are designed to function exactly like natural teeth. Not only do they look like real teeth, they are maintained and used as such, except they hold to your mouth even stronger than a natural tooth root would. Don’t let missing teeth affect your oral health. Schedule a consultation with your dentist in Carrollton today! Dr. Rajiv Shekhadiya, DDS, earned his Bachelor of Dental Surgery degree from the Government Dental College Hospital in Ahmedabad, India before earning his Doctor of Dental Surgery degree from New York University. Today, he is actively affiliated with several dental associations, including the American Dental Association, the Texas Dental Association, and the Dallas County Dallas Society. To learn more about his Carrollton practice, contact him at (469) 892-6647 or visit his website.